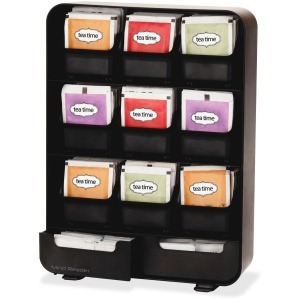 Tea organizer is both pretty and practical with a drawer to hold your favorite condiments and accessories. Nine drawers hold your favorite tea bag flavors with drop-down fronts so you can easily see the labels on the tea pouches. Each drawer holds up to 15 tea bags. Easily slide and remove each drawer for easy access and easy cleaning. The bottom level offers shallow drawer storage for condiments and tea accessories. Legs are included to secure unit from tipping. Bottom rubber grippers keep unit in place. Lightweight organizer allows easy versatility when entertaining. Shiny black plastic fits into any modern home or office.